#CivilRightsareHumanRights: ADA proposes a racial reconciliation and dialogue project which aims to deepen relationships among ADA members, their communities, and allies and to develop a platform of proposed institutional and policy changes and actions to ameliorate worldviews, systems and policies contributing to institutional racism. The proposed plan of action includes calling for a national Commission to study and propose action steps for combating institutional racism and running a multi-year strategic campaign to engage ADA members, allies, and local communities in unifying dialogue while ultimately developing a community platform and actions for addressing institutional racism. 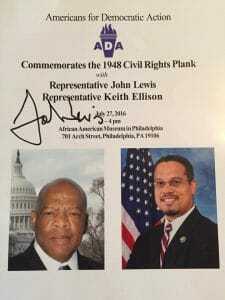 ADA’s action on civil rights dates back to its early years and continues today. In 1948, led by ADA founder Hubert Humphrey and aided other ADAers, in particular the local chapter centered in Philadelphia, we were collectively the catalyst for the adoption of the Democratic Party’s first pro-civil rights plank. On the local level ADA has a strong track record of leading community discussions, building a grassroots volunteer base, developing local leaders, especially in disenfranchised communities, and affecting local and state policy and politics. A few examples include ADA’s local leadership in developing actions and implementing those actions to reduce police abuse in Philadelphia in the 1980s. More recently, in 2014, Delaware ADA leaders embarked on a series of workshops aimed at deepening awareness and understanding of racism and oppression. The “Allyship” workshops focused on developing a foundational understanding of how racism and systemic oppression function on institutional and individual levels, building consciousness and awareness around oppression and privilege. Participants and activists engaged in interactive exercises, readings and reflection, and conversations in a non-judgmental supportive environment. The workshops were a joint project of the Social Justice Steering Committee of the Unitarian Universalist Fellowship of Newark and the Delaware chapter of Americans for Democratic Action. It is on this foundation that we aim to build for this proposed project.